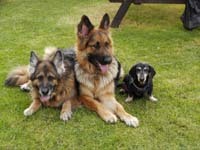 I am running the Lichfield 10k on 6th September 2009 as a personal challenge and to raise funds for Oldies Club if you feel you could sponsor me to help raise as much as possible for Oldies Club that would be fab...even just £1 would make a difference. or by emailing Angela (Oldies Club fundraising co-ordinator) at f@oldies.org.uk ,with the details including your full name and amount of sponsorship. An unashamed bump for Oldies Club and me!!! I was out this morning doing my second 4 mile run....the last mile involved a run up a very steep hill..halfway up I felt very sick and wobbly, and it was very tempting to give up ..and (this is true!) I looked up to the top of the hill and saw Ginty an Oldies dog who had been adopted near to me (I did the home visit) being walked..and I thought 'Yes that is the reason I am doing this, so that dogs like Ginty can find their forever home'....I dug in and managed to comlpete the run. Kate - just seen this- been so engrossed in websites that I ve not caught up with the rest of the world. DASH will sponsor you, at very least you have helped a lot with the Max before he went to his forever home & with the previous Poundhound dogs. Well done for attempting it- I dont do running either if I can help it. I'm a great fan of the 'Oldies'. Well done to you and I will sponsor you too. £5 from here too. Sorry it isn't more. PM me to remind me once you need the dosh hun.